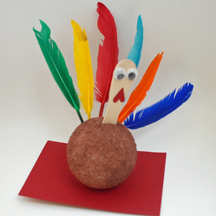 Here’s a twist on the classic handprint Thanksgiving turkey craft. 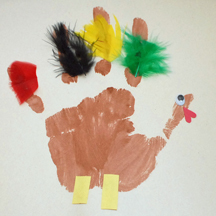 If you’re wondering why the hand in the example is so big, it’s because 3-year-old Alec didn’t feel like getting paint on his hands so Mom used her own, which gives us a chance to remind you to, as always, “enjoy the process,” because the most important thing at craft time is that preschoolers are having fun. 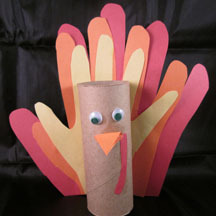 What You Need: Brown washable tempera paint; glue; feathers; googly eye; scrap of red and yellow cardstock or construction paper; full sheet of light-colored construction paper. How You Make It: Paint hand using brown paint and press onto paper. 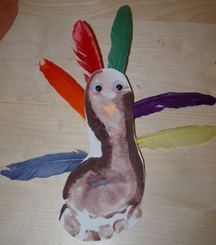 Once dry, use glue to add feathers to finger areas. Glue on googly eye. 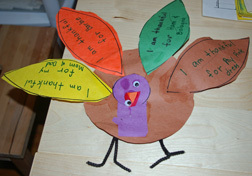 Cut out wattle shape or use a heart-shaped paper punch to make one from red paper and glue on. Cut rectangle legs from yellow construction paper and glue on.